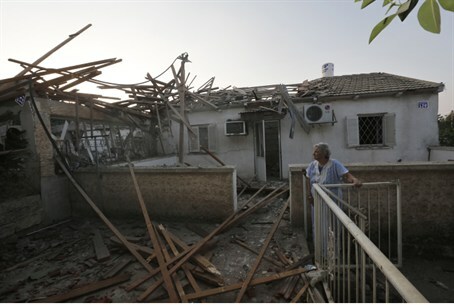 A terrorist rocket smashed into a Netivot house, causing heavy damage. No physical injuries were reported, but four were treated for shock. A Grad terrorist rocket smashed into a Netivot house Monday morning, causing heavy damage. Miraculously, no one was physically injured but four people were treated for shock and evacuated to Soroka Medical Center in Be’er Sheva. The attack occurred only hours after a ceasefire supposedly went into effect, but like dozens of similar announcements the past several years, it was not upheld. “Calm” and ceasefire usually are tactics by Hamas to help it determine whether it is worth it for terrorist organizations to continue to attack or to lay back. Egypt, now ruled by leaders of the same Muslim Brotherhood who created the Hamas terrorist organization, brokered the latest broken truce. As usual after a heavy bombardment and fear of massive IDF retaliation, Hamas leaders have gone into hiding underground to avoid pinpoint assassinations, according to Channel 10 television. Strategic Affairs Minister Moshe Ya’alon told Arutz Sheva that aerial attacks on Hamas leaders are one of the options for the IDF. The usual practice of bombing one of hundreds of terrorist tunnels or weapons storage sites is a weak deterrent to terrorists, and Israel apparently is not yet ready to carry out a large-scale ground invasion into Gaza. The last time it did so was four years ago, with the three-week Operation Cast Lead, which bore a short-lived lull in rocket attacks and unfulfilled promises by the European Union and the Obama administration to place electronic and human monitors to prevent smuggling of more advanced weapons into Gaza. Since then, Israeli military intelligence has estimated that Gaza terrorists have smuggled hundreds of tons of explosives, anti-aircraft missiles and advanced anti-tank missiles.